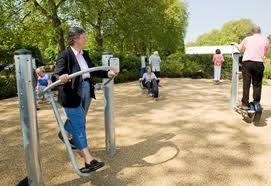 Project summary: Playground targeting residents aged 60+ Location: Hyde Park, London. 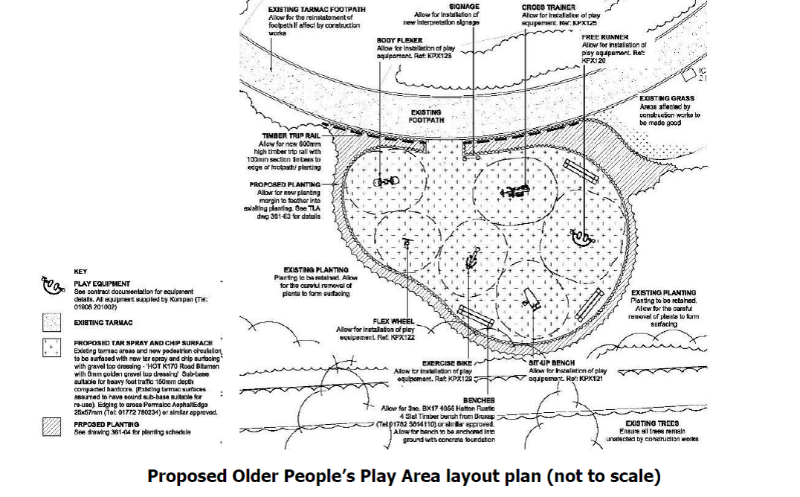 Programme: The playground has been specifically designed for older people to enjoy. The facility contains six pieces of equipment to help users improve core strength, flexibility and balance. Equipment has been selected to ensure a high level of accessibility, ease of use and enjoyment. Soon after the installation of the equipment, park sports development workers provided induction sessions for users. Although not well attended, they were useful and were attended by those that are now using the facilities frequently. Initiator: Knightsbridge Residents Association Project Duration: Opened May 2012. Expected lifespan circa 10 – 15 years Lead in Time: 18 month preparation and development phase, including a feasibility study Site Area: Small area approximately 0.0125ha (125m2) within bowling and tennis enclosure Client Team: Royal Parks - developed and designed in conjunction with the Knightsbridge Residents Association. Equipment provided by Komplan. Funding Sources: £50k (excluding landscaping) Funding Type: Internal Budgets Project Costs (Build): Materials: £50k Project Costs (Operation): Included within Royal Parks maintenance budget. Maintained as play area with daily, weekly and annual inspections. Revenue spend is between £32 – 65 per week (£1,600 - £3,300 per annum). Profitability/Loss: n/a Permissions / Permits: Planning permission was applied for from Westminster City Council. Particular challenges around providing this type of facility within an historic landscape. Local Links: The facility is adjacent to a park café and toilets and is visible from the Tennis and Bowls Centres. There are also park rangers working within the park. Publicity/advertising: There was significant international, national and local publicity like in Manchester several years previously. Since this, there has been relatively limited work undertaken on building awareness and increasing use although it is anticipated that this will be considered next year. The facility is referenced on the website. Following early feedback, improved signage was also installed into the park and it is anticipated that this will be followed through further in 2013. There have been some issues with the need to replace parts – this has occurred predominantly due to overuse. Signage is essential for several purposes - raising awareness of the facility, promoting correct use of equipment (and providing a disclaimer over use) – health and safety. the facility blends in well with the landscaping.